"What I really need is a shotgun with a sawed-off barrel, the shells to go with it, and a large-caliber handgun." 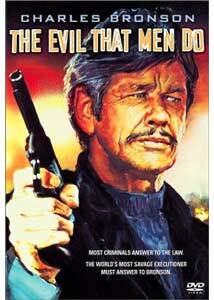 The Evil That Men Do basically aspires to be a typical Charles Bronson shoot-em-up revenge story. This time around, Bronson plays a retired assassin named Holland, who is living a peaceful life in the Cayman Islands. He is forced back into the dangerous profession of killing one more time when his friend is murdered by Dr. Clement Molloch (Joseph Maher), a sadistic fiend who conducts political torture experiments on his victims. In one of the film's most gut-wrenching moments, Holland views a video that consists of disturbing narration from Molloch's surviving victims. This man has made these poor souls suffer in ways that would make Hannibal Lecter cringe. Holland's initial refusal to come out of retirement does not last long after hearing these tragic accounts. Accompanied by his friend's young widow, Rhiana Hidalgo (Theresa Saldana), and a handy barrage of Bronson-esque weapons, Holland sets out for revenge. Most of this film had me writhing in agony like one of Dr. Molloch's patients; this is a B movie in every sense of the term. The screenplay is not only uninspired, it is downright insulting. Lines such as "He was wearing a bulletproof vest!" are very convenient for those of us who might not have understood why the villain seemed immune to gunfire. An intelligent film could have found a way to show this without using these kinds of inane remarks. Nearly every scene is executed in a way that remindsme of the generic style used for The Love Boat; I half expected Jack Jones to appear in a pop-up window and start singing. The one torture scene is harrowing, but the awful music and tawdry acting exhaustively undermine it. The over-the-top tympani notes during this sequence reminded me so much of the musical "Boing!" in Monty Python and the Holy Grail ("A shrubbery! "), that I inappropriately burst into laughter. The very most I expected from Evil was a mindless action romp, which it is not: it is simply mindless. It is as if the filmmakers wanted to prove that they could transcend the routine action genre by subtracting most of the action scenes and focusing more on the story and character development. The problem is that neither one of these elements works. I believe a six-year-old could have created more character development than what is given; even the simplest opportunities to inject some life into these characters are bypassed. When Rhiana refers to Holland as an "evil man," he responds with an elusive smile. Later, when she wonders at his ability to still see beauty in the world after so many years of killing, he all but shrugs his shoulders and walks away. Her astonishment could have opened up the door to Holland's soul, causing him to ruminate on how he got into this tiresome business. Instead, the audience is given nothing. The lack of attention to such minor details results in a film so dull and lifeless that I am wondering if veteran director J. Lee Thompson (Cape Fear) was in a coma during filming. Although I am not a big fan of Charles Bronson's work, I acknowledge that his acting capability is above that which he demonstrated in this film. Here, he delivers all of his lines as if he is trying to read them from a cue card a mile away. Perhaps the hollow nature of this character is why his performance is so poor. There is nothing intense, scary, or tough about Holland; he is just a funny-looking old geezer with a shotgun. I almost feel ashamed of myself for poking fun at him, since he comes across as such a gentle and kind man. However, gentle and kind are not what this picture calls for. I obviously cannot say enough bad things about The Evil That Men Do. By the time the picture had finally ended, I was agitated, numb, and most of all, angry. The few sufficient action scenes and the potentially interesting facet of fact-based political torture are the only redeeming qualities that prevent me from dismissing this film as a failure. The mere creation of a film like this is truly an evil that men do. Image Transfer Review: The 1.85:1 anamorphic widescreen image transfer is quite acceptable for a B movie. It appears that serious work went into preserving the original film elements, rather than the rush job that I was expecting. Colors and hues are often subdued, though there are many instances where they appear vibrant and strong. Detail is above average for a film of this age; I noticed very few artifacts even on pin-striped clothing. The main deterrent is excessive grain, which is enhanced during scenes of darkness. Black level appears surprisingly deep in most scenes, yet not quite as rich as one would hope for. Even though the picture looks understandably dated, the anamorphic widescreen image is a commendable remastering effort. A 1.33:1 pan & scan version is also available on side B. While this transfer is inferior for obvious reasons, it also appears to have quite a few more deficiencies than the anamorphic widescreen transfer does. Shimmering and pixelization are more frequent and bothersome, and the picture is slightly softer and lacking in detail. These distractions are another obvious example of how pan & scan is an evil that men do! Audio Transfer Review: The mono soundtrack is fair. Overall fidelity is balanced well, yet dialogue often sounds strident and unnatural. With surround decoding on, the soundtrack mainly stays locked in the center channel, though there are instances where it inappropriately bleeds into the left and right mains. As expected with the limitations of a monaural track, low end is never a factor. Nitpicking aside, this audio transfer faithfully reproduces the original theatrical mix, which purists will certainly appreciate. Extras Review: The only relevant extra is the theatrical trailer, presented in 1.33:1 full-frame. The trailer certainly does not help sell this film with such wonderful statements "In the execution of justice, there is no executioner like him... Bronson!!!" I may be contradicting my loathing for the film, but a few more extras would have been nice. A commentary track or even a short featurette might have cleared up some confusion as to whether or not this film was meant to be a joke. In the irrelevant portion of the special features section are two additional trailers for The Replacement Killers and The Big Hit. Both of them boast 5.1 audio and The Replacement Killers features a beautiful anamorphic widescreen transfer. The Evil That Men Do essentially serves little purpose; there are far superior films that surpass every aspect of its existence. Anyone looking to see a good film about doctors conducting political torture experiments should watch Roman Polanski's Death and the Maiden. Anyone looking for a good action film should see Die Hard. The only useful function of this DVD might be for Charles Bronson fans who feel that they absolutely need this title to complete their collection.